You are here: Home>Archive>Taylor Brown Collection.>Marriages.>Mr. and Mrs. Brown on their golden wedding anniversary. Mr. and Mrs. Brown on their golden wedding anniversary. 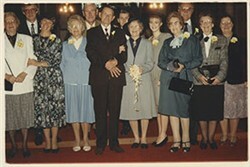 Photograph shows Mr. and Mrs. Brown in the centre surrounded by family and friends. Mrs. Brown carries a small posy and the guests are wearing yellow flowers on their lapels. The picture was taken in St George’s Church, Wolverton.